Our service range includes a wide range of boc fire suppression system, co2 fire suppression system, gas based fire suppression system, novec fire suppression system, fire suppression systems and fm 200 fire suppression system. Novec 1230 fire protection fluid is a next generation clean agent Halon alternative. Novec Suppression System combines outstanding extinguishing performance with an excellent environmental profile. Novec 1230 fire protection fluid has zero ozone depletion potential, a global warming potential of one, a five day atmospheric lifetime, and a large margin of safety for occupied spaces. Novec 1230 fire protection fluid extinguishes fire primarily by removing heat from the fire. Novec Fire Suppression System is also electrically non-conductive. 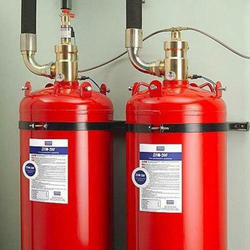 We are one of the most trusted and relaible supplier and installer of Novec Fire Suppression System in Mumbai, India. FM200 fire suppression is found as an active compound as a propellant in medical inhalers. This is goes without saying that FM200 gas is extremely safe for occupied spaces with the correct fire suppression design.There is a common misconception that FM200 gas reduces oxygen this is not true! FM200 is a synthetic/chemical fire suppression gas and extinguishes a fire by removing the free radicals or heat elements from the fire triangle. (Oxygen, Heat and Fuel). The typical concentration of an FM200 system is normally between 7.9% to 8.5%. This concentration is determined by the risk that is being protected and by the OEM (Original Equipment Manufacturers) and the ISO14520 standards for fire suppression systems. The main advantage of FM200 fire suppression, is the small amount of agent required to suppress a fire. This means fewer cylinders, therefore less wasted space for storage of FM200 cylinders. FM200 systems reach extinguishing levels in 10 seconds or less, stopping ordinary combustible, electrical, and flammable liquid fires before they cause significant damage. FM200 extinguishes the fire quickly, which means less damage, lower repair costs. Like any other fire suppression system, FM200 systems are designed with an extra margin of safety for people. Refilling FM200 is simple and cost effective, therefore, it also means less downtime and disruption to your business. FM200 is classed as a clean agent which means that it is safe to use within occupied spaces. The safety of FM200 fire suppression environments is proven in over a decade of real-world experience and validated by extensive scientific studies. FM200 systems take up less storage space than most other fire suppressants. In addition to the fire protection benefits of using FM200, the environment will benefit as well. FM200 fire suppressant does not deplete stratospheric ozone, and has minimal impact on the environment relative to the impact a catastrophic fire would have. FM200 fire suppression is a solution that is already working in more than 100 thousand applications, in more than 70 nations around the world. FM200 fire suppression is also known as HFC227ea. FM200 is a waterless fire protection system, it is discharged into the risk within 10 seconds and suppresses the fire immediately. CO2 Fire Suppression System is the solution for total CO2 flooding of Engine Rooms on Ships, Transformer rooms, heavy electrical equipments etc. The Carbon dioxide gas released in case of Fire and shuts the fire immedieately. The components used to manufacture CO2 Fire Suppression systems are of high quality and undergoes stingent testing. 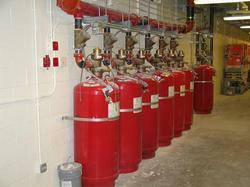 We are one of the leading supplier of Co2 Fire Suppression System in Mumbai, Thane, Pune, Nashik and Gujrat. Gas Suppression System or simply called as Automatic Fire Suppression System (or Gas Suppression System), is relatively a new technology in India. Unlike conventional system that use water, in Gas Based Fire Suppression System; water is never used and yet the fire is extinguished. Here Gas is used to extinguish the fire. Hence it is a Gas Based system. The fire gets extinguished, within a minute of activation and everything is automatic. Gas Suppression Systems (FM200) is a reliable solution based on HFC 227ea, an extinguishing agent known around the world. Built on 42-bar technology, these Gas Suppression Systems are efficient and space-saving. Whether for the valuable systems, data, people or the working environment, this Gas Suppression System provides optimum protection in case of fire and helps ensuring business continuity. The extinguishing agent of this Gas Suppression System is very effective and works at low extinguishing concentrations to protect people and assets. The extinguishing agent is chemically inert and has low electric conductivity. This Gas Suppression Systems provides ideal protection especially for areas with electrical and electronic risks of fire. Extinguishing without leaving any residue and without risking of corrosion is found in this Gas Suppression System- for example a smoldering fire in electrical switching rooms, telecommunication systems, data centers or server rooms can be checked before it spreads. FM-200 agent actively attacks the fire to extinguish flames rapidly. Engineered system providing a fast acting 10 second discharge. Offers full-developed, flexible design limits to fit any application environment. Design concentrations range from 6.25% to 7.0% for Class A and Class C hazards. Easily designed using engineered series software. 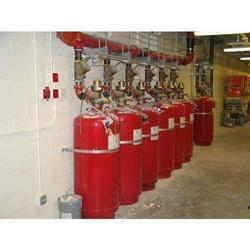 CO 2 and FM200 are commonly used fire extinguishing gases. BOC FS125.Fire Suppression System that is more efficient & requires less gas by weight it is completely Eco-friendly as well.The system has been UL listed at different operating temperatures range between -18°C and 54°C.Moreover, it is a patented formula that is introduced to reduce the amount of by products from due to fire. Looking for Fire Suppression System ?